New Wave Domesticity: Cookie Dough Cupcakes! I told my friend Annie that I would make her any cupcake she wanted for her birthday & she decided she wanted cookie dough. It seemed a little out of the box, but it was a challenge & I like that! I wanted to include actual cookie dough somehow, so I scoured the web and found out that eggless cookie dough is a synch to make and will probably be a new staple in my freezer. The eggless cookie dough fills the center & makes these cupcakes over the top decadent. There are 3 basic parts to these cupcakes: cake, filling, and frosting. I did each of these parts over a couple of days so that it wasn't so stressful the day of and it gave me a little time for adjustment. It also gives your dough plenty of time to chill. Cream butter & sugar in a mixer until light and fluffy, about 3 minutes on medium-high. Whisk together flour, baking powder, and salt and add to the mixture. Add the milk and vanilla, mix to combine. Scoop into cupcake papers about half to two-thirds full & bake in a 350 degree oven for 20-25 minutes until a knife or toothpick comes out clean. Note: you could also add chocolate chips to this batter for a chocolate boost, but I think the chips in the center were just perfect. Makes quite a bit more than you need for the cupcakes, so you will have extra for late night cravings. Cream butter with brown and white sugar in the mixer. Slowly add the flour. Add salt, milk, and vanilla extract until well combined. Finally, add the chocolate chips and fold them in by hand. Put the batter in the fridge to chill for at least an hour or up to a day or so before you assemble the cupcakes. When the dough is chilled, it makes it super easy to just roll it into small balls to put inside the cupcakes. Note: this recipe contains uncooked flour, which may seem a bit odd, but it is necessary to get a good dough flavor, but you can leave it out for a beautiful & simple brown sugar frosting. Cream brown sugar with butter. Sift the flour & confectioners sugar togeter and add slowly. Add salt, milk, and vanilla extract and mix well. For a thinner frosting, you can just add a bit more milk. Cut cone shaped pieces out of the center of each cupcake. Add a ball of chilled cookie dough to the center & frost each cupcake. Add mini chocolate chips over top. YUM! 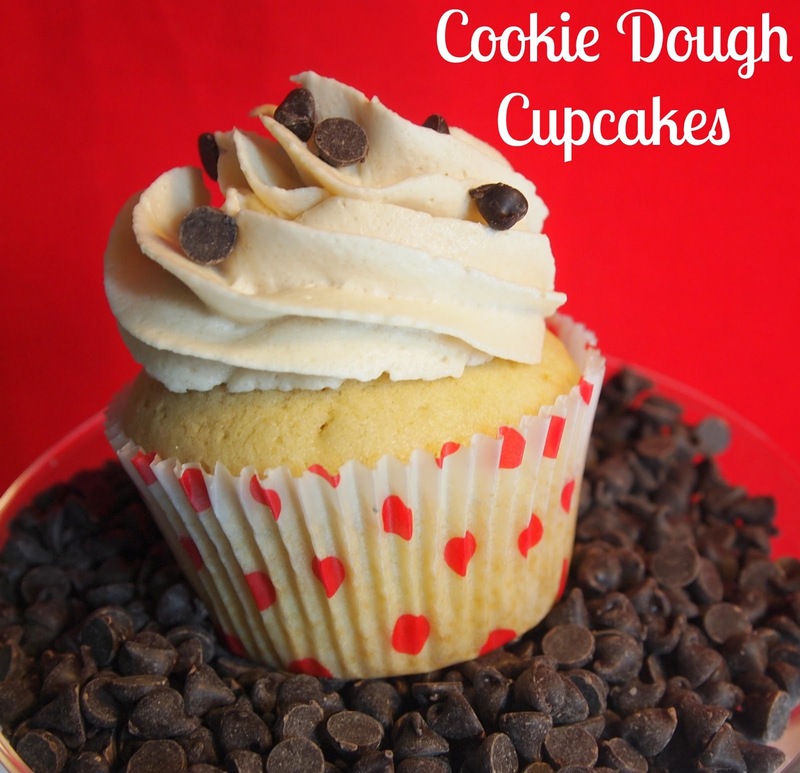 This cupcakes are really dense & heavy to hold up to the cookie dough flavor, but they are pretty amazing and they really do taste like cookie dough!